Is a changing Arctic influencing weather in the mid-latitudes? Trends in recent years indicate that declining sea ice cover in the Arctic is having an influence on severe weather patterns in the Northern Hemisphere, according to scientists such as Dr. Jennifer Francis from Rutgers University's Institute for Marine and Coastal Sciences in New Brunswick, New Jersey. Much of Dr. Francis' research focuses on the the atmosphere in the Arctic, its interlinkages with the Arctic Ocean (ice-covered or not), and how this affects weather and climate in the rest of the Northern Hemisphere. In this interview, she explains the complex processes at work. Scientists often use the term “Arctic amplification”. What does this mean exactly? And how does a changing Arctic affect people living in the mid-latitudes of the Northern Hemisphere? Arctic amplification is a term that describes the fact that the Arctic is more sensitive to global temperature changes than elsewhere on Earth. If it gets warmer around the globe, it gets even warmer in the Arctic. It works the other way, too; if it cools around the globe, it cools even more in the Arctic. This is due to a number of positive feedbacks in the Arctic system that enhance whatever changes are happening. One of the most well-known positive feedbacks is the ice-albedo feedback. As the sea ice recedes in the Arctic Ocean – as it's been doing quite rapidly over the last few decades – it exposes the open ocean to the summer sunshine. The ice is very white and the ocean is very dark. So instead of reflecting that sunshine back into outer space, with the ice cover having diminished so much, all of the heat energy from the sun goes directly into the Arctic Ocean and warms it. This process is adding energy to the global climate system that otherwise would not have entered the system. It helps warm the Arctic Ocean, which increases the rate of warming in the region. What happens to the heat once it's been absorbed? I did a rough calculation of the amount of extra heat that was absorbed in the Arctic Ocean this past summer, when the sea ice extent reached about half of the average extent observed between 1979 and 2000. You can measure it by just looking at how warm the ocean temperature has become in areas that used to be covered by ice. After the summer melt period, all that extra energy absorbed by the ocean has to be re-released into the atmosphere in the autumn before sea ice can start to form again. Based on how much the Arctic Ocean warmed, I estimated that it's about the same amount of energy that the entire United States would use in 26 years. That's a lot of energy. As the energy gets re-released in the autumn, the atmosphere warms it up. The energy can be transferred in several ways: normal heat, water vapour (which contains a lot of latent heat), or as long-wave radiation (also known as infrared radiation). If you look at observations of air temperature over the Arctic, you can see that it was very warm during the autumn of 2012, and that warmth extended a few kilometres up into the atmosphere. And the heat in the atmosphere spread out into the regions surrounding the Arctic. So the diminishing ice has been having a large effect on a thick layer of the atmosphere. How were you able to draw these conclusions? There are data sets available created by the computer models that do our weather forecasting, called reanalysis data sets. Because weather forecasting models are constantly being improved and changed, they take a version of the weather forecast model for the whole globe and keep the computer model the same. All of the data that normally go into the weather forecast models – such as measurements from weather balloons, aircraft, ships, ocean buoys, satellites, surface pressure and temperature readings, etc. – are re-ingested into the model. The version used in the US has been re-processed back to 1948. There's been research suggesting that the extra heat in the Arctic is affecting the jet stream, which in turn creates blocking patterns in the atmosphere. Could you explain this process? The jet stream, which is a very fast current of air moving west to east about 10 km up in the atmosphere, is created by the difference in temperature between the mid-latitudes in the Northern Hemisphere and the Arctic. Normally the Arctic is cold and it's warmer in the mid-latitudes. Generally speaking, the jet stream moves faster when that temperature difference is greater. But as the Arctic has been warming at a faster rate than in the mid-latitudes, this difference in temperature has been decreasing. As this temperature difference has been decreasing over the last several decades, so have the west to east winds in the jet stream. We know that the jet stream generally takes a wavier path in a north-south direction when its winds are weaker. A warmer Arctic also tends to stretch the northern peaks of those waves farther northward, which also increases the waviness. The waves in the jet stream control our weather. They generate and steer both the low-pressure areas, which include storms, and the high pressure areas of good weather. When the waves are larger, they tend to shift more slowly from west to east, as does the weather we experience on the surface that’s associated with those waves. It seems like the weather gets “stuck” more often in a particular pattern when this happens. Taking that to the nth degree, you would expect that certain kinds of extreme weather related to persistent weather conditions would occur more often. Take droughts, for example. If it's dry for a few days in a certain place, it's not a problem. But if it goes on for a few weeks, then it's a problem. The same goes for rain. A typical rainstorm is no big deal. But if it rains for days on end, then we're looking at the possibility of flooding. 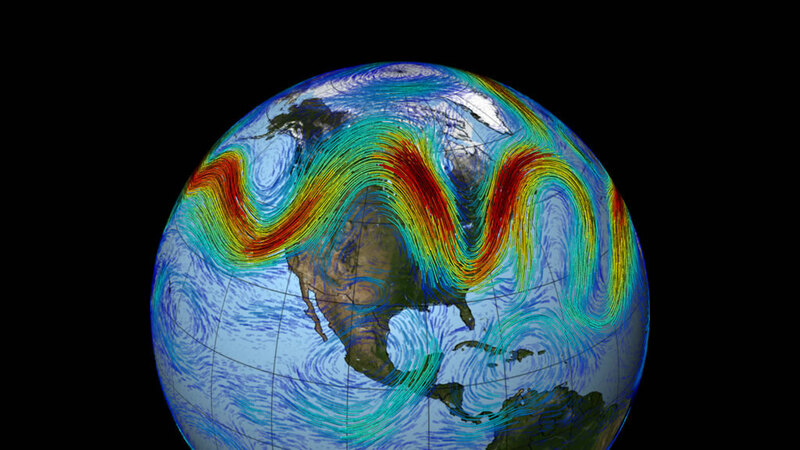 So in short, as the Arctic warms, the waves in the jet stream tend to get larger, and as a consequence, the weather patterns associated with them move more slowly, increasing the possibility of having more extreme weather in the Northern Hemisphere. Is there any way to tie the phenomena of the jet stream shifting to a particular storm, or is that not possible? You really can't tie it directly to any particular storm. 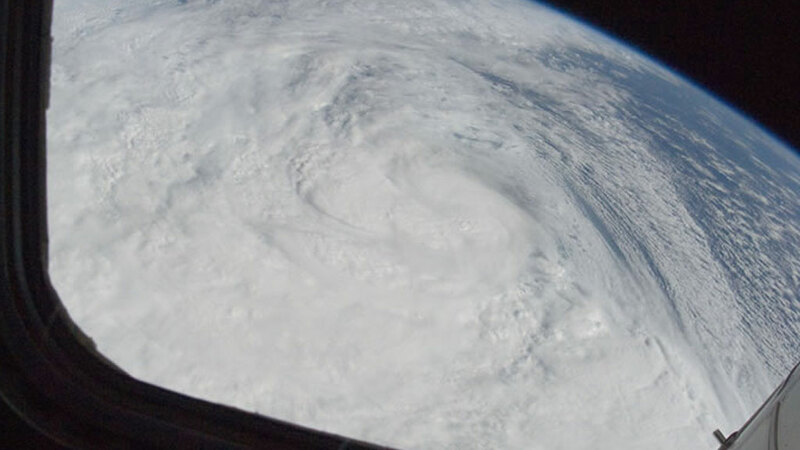 What we do know is that climate change in general is changing the backdrop of all storms. So any storm we have now is working with more heat and water vapour, which gives it more energy and greater rain potential. So you can't say climate change isn't having an effect. But to look at one particular storm and say that because it's warmer in the Arctic, this particular storm did such and such differently, we can't do that yet. At this point it's all about looking at statistical trends, long-term changes, and how the jet stream pattern and trajectory has been changing over time. How clearly can you distinguish the role of human influences from natural variation and climate cycles such as the Arctic Oscillation and El Niño? Our best tools for this task are the extremely complex global climate computer models that use a combination of mathematical, physical relationships and parameterizations to simulate the behaviour of the climate system. While not perfect, they do a remarkable job of recreating past climate behaviour, including natural climate oscillations like the Artcic Oscillation and El Niño. The models can be used to simulate the climate system, both with and without human influences to see which best represents the real world. It’s very clear that without including human influences, the models cannot recreate changes in temperatures, precipitation patterns, and many other features that have been observed during the past century. With regards to reaching a tipping point where we start to see significant changes in the climate, is it something that's foreseeable in the near future, or is it something purely theoretical? Tipping points are tough because it's hard to define exactly when you've reached one. It's not like falling off a cliff in most cases. A lot of gradual changes can take place. It depends on how you think of a tipping point. Is it something you can't turn back from after you've passed a certain point? Defining that point and when it happens is pretty tough. I would say, however, that at this point in time we've put so much carbon dioxide (CO2) into the atmosphere that we have in a way passed a tipping point. There's more carbon dioxide in the atmosphere at this point now than at any point in at least the last 650,000 years. The global temperature of the Earth is far behind where it should be for the level of carbon dioxide we currently have in the atmosphere, which means we've got a lot of change coming our way that we really can't do anything about, even if we stop emitting greenhouse gases today. The carbon dioxide is already in the atmosphere and it takes a long time to decrease naturally. We can't remove it in sufficient quantities to make any difference. So if you take as your tipping point the fact that we've surpassed a point where even if we stop emitting greenhouse gasses now we won't be able to stop the changes that are heading our way, then you could say we've already passed a tipping point. There's so much evidence out there telling us that changes are happening rapidly in the climate system and that we're only going to see more of these rapid changes. When you say temperatures are below where they should be for the amount of CO2 that's already in the atmosphere, is that based on paleoclimate research? You've probably seen some graphs like the EPICA curve that look at the correlation between CO2 levels and temperature going back hundreds of thousands of years. It's very clear from these paleoclimate data that we're way below where we should be in terms of global average temperature, given current CO2 levels. The temperature is where it should be for a typical interglacial period like the one we're currently in, but the CO2 levels are way above what they should be. The last time the Arctic was as warm as it is now was 125,000 years ago, during the last interglacial period, the Eemian. However sea levels back then were about 6 metres higher than they currently are. What ended the last major interglacial period in Earth's history? It had to do with the Milankovitch Cycles – the changes in the Earth's orbit in relation to the sun and tilt relative to the orbital plane, which affects how much solar radiation the planet receives and the distribution of that energy around the globe. This has been the main driver for the cycle between glacial and interglacial periods over the past several hundreds of milennia. Is there any natural climate mechanism on the horizon that might disrupt the kind of positive feedback mechanisms that are causing rapid warming of the Arctic? Not as long as greenhouse gasses continue to be emitted into the atmosphere at ever-increasing rates. This is really the root of the problem. We could have a huge volcanic eruption that puts a lot of dust in the atmosphere and slows down the warming for a few years. That's happened before. But as long as greenhouse gasses continue to increase, we're looking at continued warming. There have been proposals to put sulphur dioxide (SO2) particles into the atmosphere, which would reflect some solar radiation back into space and cool the planet a bit. I've been communicating with some of the people who proposed this idea. Theoretically, it's possible, but practically speaking, I'm very dubious that we could put enough particles in the atmosphere to be effective. It would be expensive, and it would have to be sustained for many years, until greenhouse gas concentrations can be reduced to pre-industrial levels. Otherwise the warming will bounce right back. There are a lot of ideas floating around out there. One has been to seed clouds to make them thicker and brighter. And another has been to spray the Arctic sea ice with a white coating to make it more reflective. But in all those cases, I don't think it's feasible to do it on a large enough scale and keep it going for a long enough time to make enough of a difference. Not unless we do something about the greenhouse gas emissions at the same time. The “disease” is still there. These ideas would just be treating some of the symptoms. I think there are better ways to use our energies and resources: try to get a better understanding of the kinds of problems that are headed our way and to help the people in the countries who are going to be the most affected adapt to what's coming. Do you think severe weather events of 2012 such as Superstorm Sandy have caused the general public and decision-makers to have a different look at climate change? In the US, many people have been choosing to not believe that the Earth's climate is changing and that humans are causing it. But if there's a silver lining to what 's been happening lately in terms of extreme weather and very obvious changes in the climate system – like sea ice extent disappearing by 50% in just the last 30 years and its volume by 80% over the same time period – it's that people are starting to take notice of these very obvious changes in the climate system. And I think policymakers are starting to realize that their constituents are interested in this. Many of them do whatever they need to do to get elected. So if the people decide that climate change is an important issue, my hope is that they will, too.Perhaps that will lead to policies that will curb greenhouse gas emissions, encourage development of renewable energy sources, promote energy conservation, and prepare vulnerable communities for the changes to come. Jennifer Francis earned a B.S. in Meteorology from San Jose State University in 1988 and a PhD in Atmospheric Sciences from the University of Washington in 1994. As a professor at Rutgers University since 1994, she has taught courses in satellite remote sensing and climate-change issues, and also co-founded and co-directed the Rutgers Climate and Environmental Change Initiative. Presently she is a Research Professor with the Rutgers Institute of Marine and Coastal Sciences and studies Arctic climate change and Arctic-global climate linkages with ~40 peer-reviewed publications on these topics.